We want to inform you about a recently published application called Vertech. We have tested it and found that it is set to display commercial advertisements and for this reason, we have classified it as adware and recommend that you remove it as soon as possible. Obviously, advertisements are unwelcome, but the ads presented by this application are not only annoying but intrusive as well so they will definitely hinder your browsing experience. Moreover, the promoted content from unknown advertisers, so there is no way to determine whether the ads are safe. Adware is a type of software that is dedicated to promoting certain content, and while some of it have somewhat useful functions, most adware has nothing to offer and is devoted to displaying ads only. While researching this application, we found that it is set to disable the check for unverified extensions for Internet Explorer and it modifies a certain policy in the Windows Registry to do so. Take note that it is also supported by Mozilla Firefox and works exactly like on Internet Explorer. Vertech is by no means a unique application because it displays its advertisements in the form of pop-ups that it renders when you browse the web and click legitimate links. While testing this adware we noticed that its advertisements are quite intrusive as it will render the pop-up advertisements very often and they will get in the way of your browsing window so you will have to close them. Apart from being annoying, the advertisements pose a significant threat to your computer’s security. Research has shown that the ads come from unknown entities that may engage in promoting illicit content. By clicking the pop-ups, you may initiate downloads of malicious software that may be disguised as legitimate. 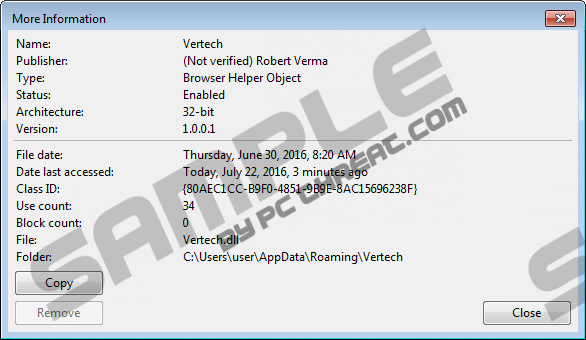 While conducting our research we found that Vertech was created by a person named Robert Verma. However, this publisher is unverified, and we did not find any additional information about this developer to determine whether it is legitimate. Therefore, we conclude that it comes from an unknown and untrustworthy developer that is only interested in making as much money as possible. As far as its distribution methods are concerned, we have discovered that Vertech is currently being disseminated with the help of software bundling. We have found that its developer has made arrangements to bundle this adware with malicious software bundles that are put up for download on freeware distributing websites. We think that the installers are configured to hide the presence of this adware in order to install it secretly. Nevertheless, you might be able to opt out the installation of this program by selecting advanced/custom installation settings and unchecking Vertech’s checkbox. If you install this program, you will not be able to uninstall it via Control Panel because the uninstaller does not work. It will only remove Vertech from the program list, but the program’s files will remain on your computer and continue to operate as normal. Therefore, you have to delete its files manually from every location. In addition to that, you will have to erase all of its registry keys to ensure your computer’s security. In conclusion, Vertech’s objective is clear — it is dedicated to rendering annoying pop-ups to generate as much advertising revenue as possible. You, on the other hand, get to view them, and as we have stated previously, the promoted content may be unsafe and jeopardize your computer’s security. Therefore, it is of utmost importance that you delete all of its files that have been scattered in different places on your PC. If you experience problems while attempting to get rid of its files, use our featured anti-malware scanner SpyHunter as it is more than capable of dealing with his adware and preventing similar applications from even entering your PC. Enter each of the following file paths in the File Explorer. Find the folder named Vertech and delete it. Close the File Explorer and press Windows+R keys. Navigate to the registry keys below and delete them. Quick & tested solution for Vertech removal.